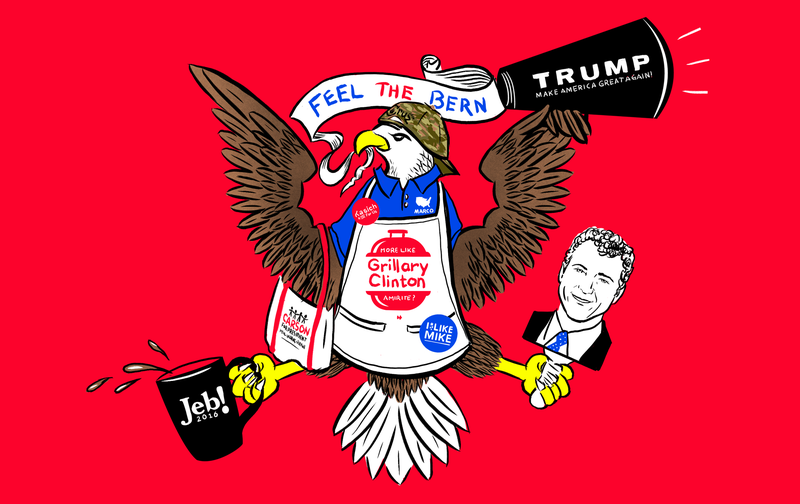 From $1,000 copies of the Constitution to $75 guacamole bowls to “Grillary Clinton” aprons, the world of presidential campaign merchandise is a strange one, and nowhere is that clearer than on the internet, where some of our illustrious candidates have launched merch stores that come in every degree of corny. Before you peruse our highly scientific ranking of these amazing webpages, let us have a moment of silence for Scott Walker’s former campaign store, where you could pay $300 for a copy of his book about destroying unions. For someone who seems to be running just to further his personal brand of being completely intolerable, Huckabee stumbles hard in the branding department. He’s still trotting out his 2008 slogan (“I Like Mike”), he’s got an immediately forgettable hashtag (#ImWithHuck), and he doesn’t have any coffee mugs available for purchase. The “Defeat the Clinton Machine” shirt is a nice touch, but it also doesn’t say anything about, you know, Mike Huckabee running for president. Why not sell mock $10 bills with his wife’s face on them? According to reports from late July, John Kasich has raised about $12 million for his campaign. From the looks of his merchandise, approximately zero percent of that money has gone towards a graphic designer. His uninspiring logo, which pairs nicely with his uninspiring slogan “Kasich for Us,” is the only thing that appears on any of his equally boring items: coffee mugs, bumper stickers, T-shirts. Donald Trump has more variety just in his hat section. If you’ve seen his “I just woke up from a long nap” style of debating, it won’t surprise you to learn that Ben Carson’s campaign store lacks flair. He wants everyone to remember that he’s a pediatric neurosurgeon, and his store features nine items specifically designed for kids and babies as a result. Unfortunately, as far as we can tell, none of this is specially designed for conjoined twins. Even worse, you can’t buy a copy of Gifted Hands, the made-for-TV movie starring Cuba Gooding, Jr. as the man himself. Bernie’s politics may be left of center, but his meager merch offerings (T-shirts, keychains, hats, bibs) plant him firmly in the boring old mainstream. C’mon, dude—you’re a commie from Vermont. Where are the signed copies of Das Kapital? Where are the “Feel the Bern” vapes? Production note: “Every item in our store will always be made and printed by union workers right here in the United States,” which is a nice touch, at least. Marco’s small online store gets points for charm when you notice that every item is vaguely reminiscent of his past foibles. The “Water Great Nation” water bottle reminds us of when he sipped Poland Spring. The Rubio football shirt reminds us of when he nailed that kid with a football. And the ability to “buy Marco a plane ticket” reminds us that he’s pretty much kinda totally broke. At least he can make (and take) a joke? He is joking, right? Jeb! got a lot of hate for the $75 guacamole bowl, but his campaign store is generally free of cringe-inducing material. There are shirts about how much he loves his dad, no shirts about how much he loves his brother, and a Jeb! coffee mug (insert your own “low energy” joke here). And then there’s the “Vintage Jeb” tank, which is seemingly designed for that frat bro of yours who always wears a “Reagan/Bush ’84” sweatshirt. Also, if that guacamole bowl is trying to pander to the Hispanic vote to win the presidency—and I think that’s the idea?—his haters are gonna look pretty stupid. Everything in Hillary’s store—from the backpacks to the spatulas—is gorgeously designed, consummately professional, mildly amusing, and totally inoffensive. Remind you of anyone? You can almost smell the focus-group testing. And yet, somehow, the “Chillary Clinton” koozie combo pack (two for the price of one!) slipped by, as did the charming throw pillow to the right there, which is a steal at $55, thought it might just as easily be appropriated by Carly Fiorina. Or try the $35 iPhone case, if you’re trying to give someone a seizure. Nice logo, though. Trump’s “Make America Great Again” hat is the only piece of campaign merchandise that’s attained crossover success, and he’s clearly resting on his laurels. Nothing else in his store is likely to capture your interest, unless you want to buy reusable Solo cups that say “Trump” on them. On the other hand, that hat is pretty great—and there are 15 different versions available for purchase. Give the people what they want. Sure, there are a lot of things you can get on a stick, but can you get the next leader of the free world on a stick? Huh? Honorable mention: Chris Christie has no online store, but you can get an anti-Hillary bumper sticker if you donate more than five dollars. Wouldn’t it make more sense to get a Chris Christie sticker? Whatever. Petey Menz is a freelance writer and former college radio DJ. Follow him on Twitter. Additional images from candidate stores linked above.